TWO music groups in Sodbury were given a cash boost from a project run by supermarket firm Waitrose. Chipping Sodbury Music Society and the Sodbury Jazz and Blues Festival received the windfall from the company’s Community Matters scheme. The monthly pay-out involves customers of individual stores choosing a favourite local project by dropping a green token into a box once they have done their shopping. Every month, each store then shares out £1,000 between three local schemes, with individual sums based on the number of tokens in the box. Since its launch in 2008, the scheme has donated £14 million to a variety of charities nationwide. The music society, which has received £413, said it was grateful for the support from Waitrose and its customers. Stuart Hobday, one of the organisers of the jazz and blues festival said: “The money enabled us to continue to stage concerts around the town featuring professional jazz and blues musicians. 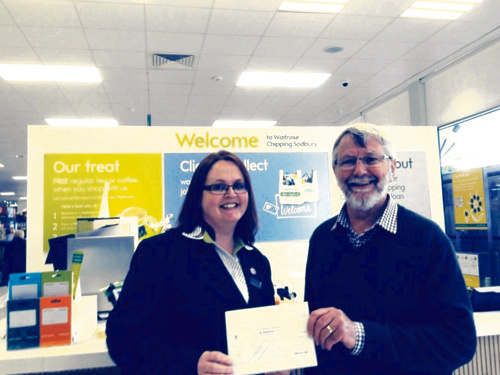 Pic: Fred Willington, chairman of Chipping Sodbury Music Society receives a cheque for £413 from Kelly Matthews at the Waitrose store in Chipping Sodbury.